Rhode Island Governor Gina Raimondo used her State of the State address Tuesday to propose a series of investments that she said are needed to strengthen the state, including an expansion of a widely debated free tuition program. But the extent to which the General Assembly will go along with the governor’s wish-list remains uncertain. 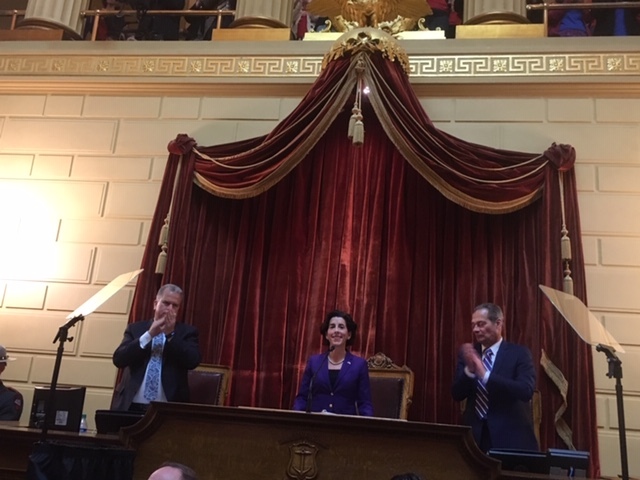 With some economists expecting a recession, Raimondo used her annual speech to say now is the time to shape Rhode Island for the better. One of her new proposals would make the last two years of a four-year education at Rhode Island College tuition-free. Raimondo said that would offer a big bang for the buck. Raimondo won a decisive victory to gain a second term last November. And she got an enthusiastic response at many points during her State of the State speech in the House chamber at the Statehouse. She warmly embraced House Speaker Nicholas Mattiello and Senate President Dominick Ruggerio at the outset of her remarks. The governor’s other proposals include raising school funding by $30 million, hiking the minimum wage from 10.50 to 11.10 an hour, and creating universal pre-K by the time she leaves office. Raimondo did not mention one of her most high-profile initiatives – a move in her forthcoming budget proposal to legalize marijuana for adult use and closely regulate it. But she did hit on the need to improve the state’s under-performing public schools following disappointing recent test scores on a standardized test. Speaking with reporters after the governor’s speech, Speaker Nicholas Mattiello applauded Raimondo’s focus on education. He said the governor has a lot of good ideas, but he said it’s unclear if the state can afford them all while facing a $160 million deficit. “I was doing math while the governor was speaking and I was having difficulty adding the numbers up,” Mattiello said. Senate President Dominick Ruggerio was non-committal on Raimondo's proposal to expand the free tuition program to RIC. Among other things, the governor said her budget includes expanded job training and apprenticeship programs and a goal of doubling the number of loans made by a state small-business loan fund. On a day when state representatives who support Speaker Mattiello offered their own bill to codify Roe v. Wade, Raimondo’s speech included one sentence calling for the enactment of a measure to protect abortion rights in the state. Raimondo also said she will back a new initiative on mental health in schools. The governor will offer her budget plan to the legislature Thursday. House Minority Leader Blake Filippi (R-New Shorehan) said the state’s focus should be on improving Rhode Island’s under-performing public schools. He also called for a heightened focus on cutting spending. The General Assembly will hold months of hearings on the governor’s spending proposal, make some changes, and then sign off on a revised budget, usually ahead of the July 1 start of the next fiscal year.